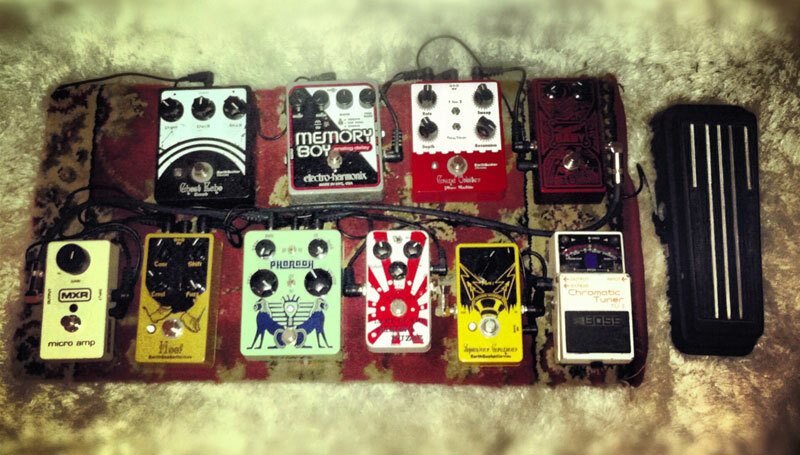 Today’s pedal line is from Dean Mulone. If you have a pedal line (doesn’t have to be in a board) for your rig, please email me a photo, bio, description of pedals and routing to pedalline@nulleffectsbay.com. Every Friday I’ll showcase a pedal line submission. Make sure you include any links to your band or music page. My name is Dean Mulone and I play guitar in the Boston based garage rock band Dirty Virgins (www.dirtyvirgins.bandcamp.com) .Our songs cover a lot of ground genre wise so I’ve sculpted my board around having to switch styles frequently, especially since our other guitar player only uses a big muff and tube screamer. I play a 1999 Fender Tex Mex Strat, and a 2004 Gretsch G5120 thru a 2001 Fender Tweed Deluxe with a 2×12 extension cab for shows and record with a modded Epiphone Valve Jr. Head thru said 2×12. Fridge buzz electronics Land Of The Rising Fuzzz: old school shin-ei style fuzz. Give a great low-fi, zippery effect. BlackArts Toneworks Pharaoh: super versatile fuzz that I mainly use as a beefy OD. Set to the low gain germanium settings that gives a nice fat rumble.